"Unlock The Real Value of ERP with CRM integration"
Salt reduces risk in SAP systems by providing current, accurate SAP change intelligence on systems and code. Salt provides specific data to the appropriate stakeholders, who can then act quickly to make improvements or to avoid disaster. 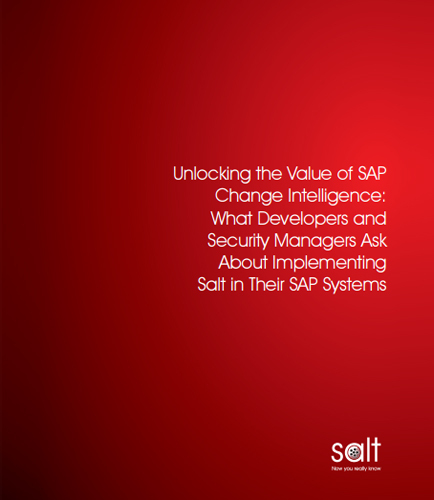 This whitepaper describes the eight Salt applications that comprise the suite, stating technical and business benefits of the intelligence they deliver and describing Salt’s safe, secure and problem-free implementation process. Developers are code-centric, and Salt’s Developer Utilities helps to work faster and more productively. Salt’s Landscape Management applications helps you to understand the state of play in each system, for example, un-promoted code left in QAS leads to incorrect test results. Salt’s Object Repositories guards against potentially expensive disasters with auto-save and archiving and keep custom ABAP code and data dictionary objects safe and secure. Salt is an excellent complement to your SAP change control processes already in place. And if you have not yet automated your processes, Salt provides a great starting point to understanding your actual SAP change control needs.